Grilling is a summer staple activity. Cooking this easy grilled salmon dish is simple and delicious, especially with a silky smooth corn puree and a crisp, but light, fennel salad. One of the things I love about summer is grilling! It is truly an science to grill something correctly, but once you get the knack of it, grilling food is fun and tasty! I love the flavor that grills naturally give to food; nothing beats that gorgeous charcoal flavor from a grill. 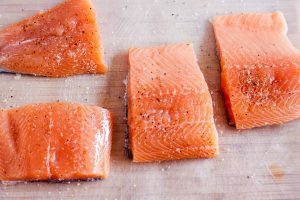 While most people would be intimidated about grilling a salmon (or any fish for that matter), I’m here to tell and show you how easy grilling salmon is! Probably the biggest tip to give on grilling anything is knowing your grill. Grills will tend to have hot and cold spots, whether it’s a charcoal or gas grill. 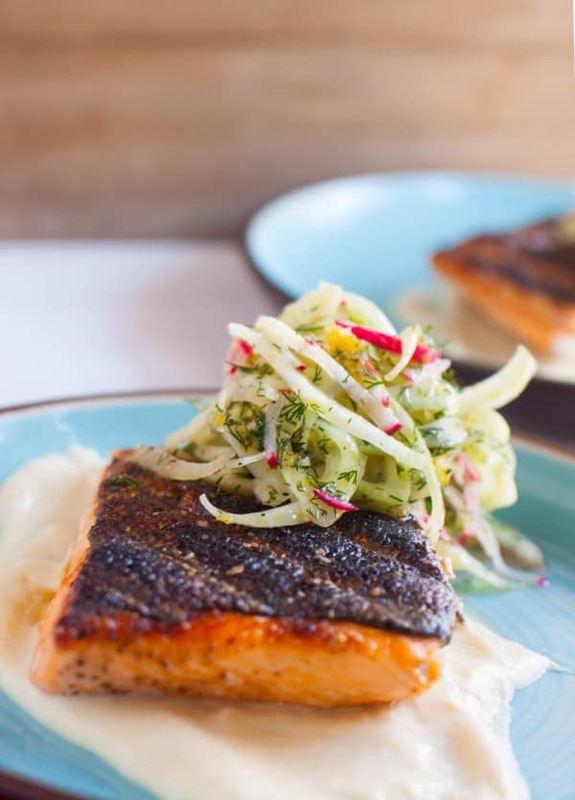 Knowing where these spots are will help you achieve the kind of char on food; this helps you know where to rotate foods to get the char or to rest. Running your hand a few inches about the grill will help you know where these spots are. I, personally, love salmon with the skin on and I think it makes grilling so much easier. With the way that fish muscle is designed, it’s very flaky. Which is super desirable when eating but not so much when you’re trying to keep a filet together. 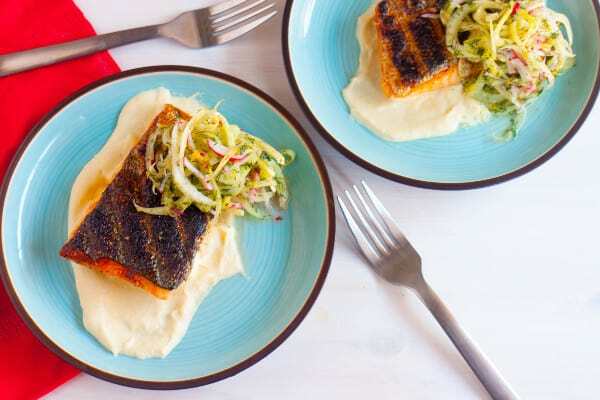 By keeping the skin on the fish, you create a surface for the muscle of the fish to stick to as the proteins set by the heat. This reduces the flaking! If you aren’t a huge fan of the skin, I would still grill the salmon with the skin on but I would remove once the fish was done resting. 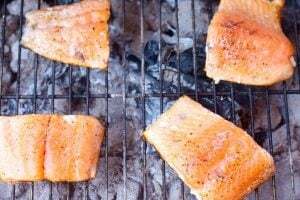 Now that the salmon has achieved superior grill marks, because you picked a stellar spot on the grill to let it cook, it’s time to remove the fish from the grill. I would highly suggest using a fish spatula. A fish spatula is slightly rounded and curved to fit the shape that fish have and is fantastic for flipping fish. Though we’re not flipping the fish over! 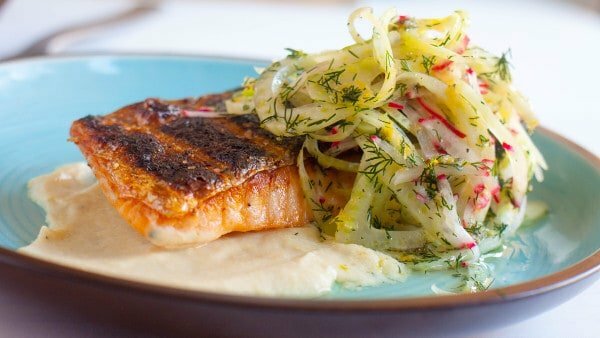 Remove the salmon from the grill and on to a platter. Cover with tin foil and let it rest. Perfection! I went out to dinner with a friend of mine as a celebration and got a dish with a velvety smooth sweet corn puree. It was my mission to replicate this as best as possible! 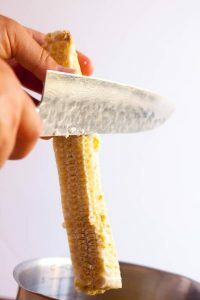 To get a full corn flavor to this puree, I scrape the back of my knife down the corn cob to release the corn “milk.” This “milk” is full of starch and corniness and should never be left behind! I wanted to season my corn puree without there being specks of seasonings throughout. This is where cheese cloth comes in super handy. 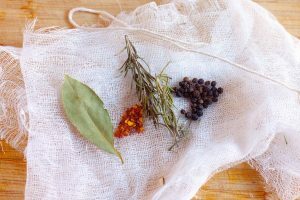 It’s as easy as throwing my seasonings into the cheesecloth, tying it up into a satchel (the French call it sachet d’espices) with some butchers twice and voila! You can remove it once the puree is done cooking and you have all the flavor you could ever imagine. Just blend this up, with a fraction of the liquid, strain through a fine mesh strainer and there you have it. The best corn puree you’ve ever had! 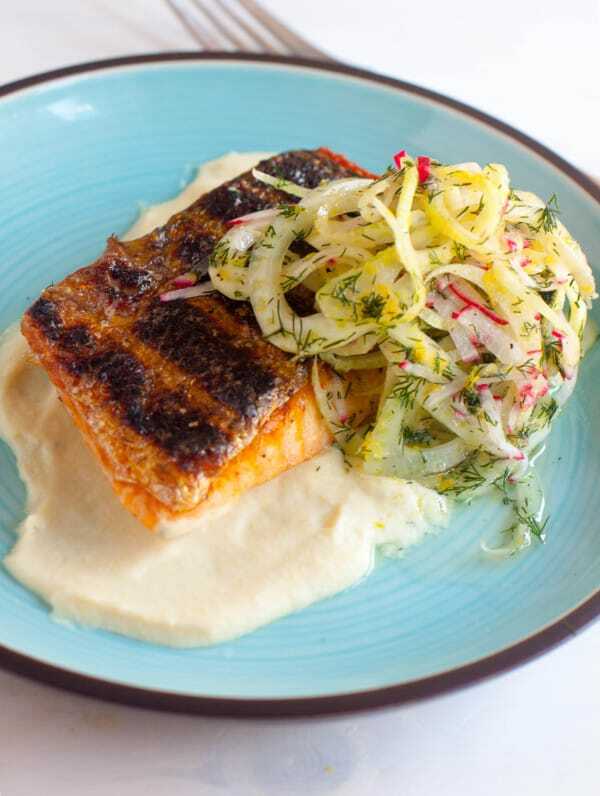 Have fun with this easy grilled salmon dish, and especially the corn puree! If you are just itching to pair a lovely barbeque with this dish, check out my Moroccan Honey BBQ Sauce here. 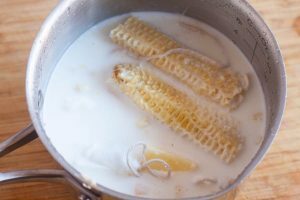 Remove kernels from corn cobs and scrape “milk” out of cobs. Place seasonings in cheesecloth and tie with butchers twine to create a satchel. In a medium sauce pot, over medium heat, bring ingredients (and cobs) to a boil and cook until corn is tender, about 15 minutes. Discard cobs and satchel. Using a blender, blend together cooked corn kernels and ¼ of cooking liquid until smooth. 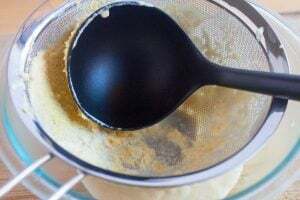 Using a fine mesh strainer over a medium mixing bowl, press blended corn into strainer until a smooth puree comes out. Discard remnants of corn kernels. Puree should be thick, like baby food. 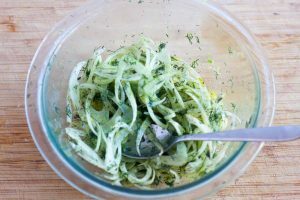 In a small mixing bowl, mix together fennel, radishes, lemon zest and dill. When ready to plate, dress salad with lemon juice, olive oil and seasonings. Preheat grill about 30 minutes before ready to cook. Take salmon out around same time and clean the filet. Rub down with a wet cloth to remove slime. Dry with a dry cloth. Make sure pin bones are removed from the meat. Season filets with oil, salt and pepper. 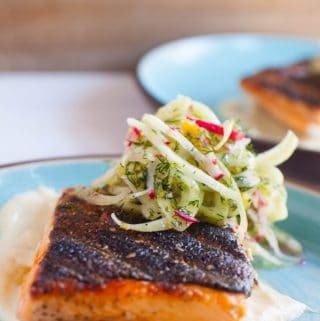 When grill is ready for the salmon, place salmon on grill and allow to cook for 10 minutes. Pull salmon from grill and cover with tin foil. Allow to rest for 10 minutes for the salmon to carry over cooking. Smear ¼ of the corn puree on the plate. Place salmon on top of the corn, skin side up. Dress fennel salad and garnish plate with the salad.